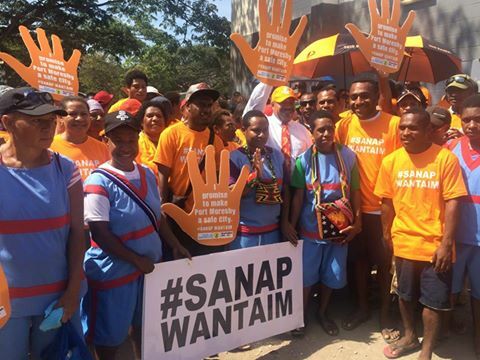 Hundreds of people turned out for the SANAP WANTAIM campaign walk to Parliament today to show their support for victims of gender based violence and to raise awareness for Port Moresby city to become a safe city for women and girls. People from all walks of life braced the sun’s heat and joined the walk from Ward Strip school at Gordon all the way to parliament to show solidarity in ending this form of violence. The groups that walked were Ward Strip students, some Bomana prison remandees, youth activists, Yoga enthusiasts, mothers, dads and anyone who had decided to join. Governor for NCD Powes Parkop was out to show his support and proved his physically fitness too when he walked among all the school children to the Parliament house. He said that to end gender based violence in our communities, everyone had a part to play to help.